Recently, while driving to work, I ran over two animals. The first was a red squirrel and the second was a gray squirrel. The red squirrel was just a little critter. Every red squirrel I’ve ever seen is just a little critter, not much bigger than a big mouse, but they’re fierce and aggressive around the larger but still relatively small gray squirrels. I don’t enjoy killing animals. When I do kill an animal, it’s accidental, mostly. I still swat mosquitoes pretty quickly and I still smash black ants when I catch them on my desk. I used to kill insects all the time when I was a kid, with no real understanding of the difference between life and death—alive one moment and a smudge on the cement the next. Now that I’m somewhat older (I’m getting deeper into my 30’s) I find that I’m much more aware of that invisible line between life and death, breathing and not breathing, feeling and numbness or nothing at all. The awareness of that line hurts sometimes. And that hurt is a bottomless black thing. It’s sadness. It’s the end of something being something. It’s a furry little red squirrel running across the street, clear of my car and then suddenly cutting back in a fit of indecision, oh I forgot my snack, and then it’s the end of that furry red squirrel with a wet popping sound beneath my tire. And then it’s me pounding my steering wheel, wondering why, why did that stupid mothergrabbing red squirrel have to cut back under my tire? The gray squirrel was just as bad, leading another gray squirrel out from the edge of a green lawn. The following squirrel stopped at the curb when he saw my car coming, and the leading squirrel, who looked like he was fit to move past my churning wheels just in time, simply stopped, and then looked at me just before I popped him under my tire, too. And maybe this death was worse than the first, but it’s hard to say. The death of the red squirrel was a blur of confusion, and the death of the gray squirrel was more like a suicide. And his friend at the edge of the lawn watched him die. Brutal. Wrenching. Man oh man. I wanted to turn around and go home. It wasn’t going to be a good day, not with two deaths on my hands before most people have their breakfast. I needed to stop driving so I could hit some kind of re-set button but I also needed to get to work. I tried to convince myself that I’d done all I could do—with the exception of coming to a complete, screeching stop—to avoid killing them. I certainly didn’t want to kill them, and when I saw them coming into the street I thought for sure they had me beat. But it was their time to go, to pluck the invisible string between this world and the next, to offer me the assist in the string plucking. I’m not sure I had a choice but I suppose it doesn’t really matter. 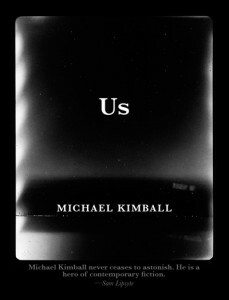 That morning I was nearly finished with Michal Kimball’s Us. I planned on finishing it when I got home at the end of the day. I made it home without killing anything else, at least as far as I know. I could’ve killed some flies or something, some ants. All in all, though, it turned out to be an okay day. Nothing else terrible happened. I made it home, I finished the book. And it killed me. I played the role of the red squirrel cutting back underneath the tire. I played the role of the gray squirrel stopping in the road to meet my death with chin held high. I became road kill, doomed to be flattened and spread along the blacktop until the ants and the bugs and the birds carried and pecked me away. In truth, though, Us didn’t really kill me. Instead, it played the song that’s played on that line separating breath and not breath, which, I suspect, is more potent than death because it’s death experienced while living, it’s shoving your face into death and then jerking back out, gasping, cheeks dripping. Kimball’s Us played the single note, actually, that that string can play. And damn what a note it is. And damn I can’t think of many writers (or any off the top of my head) who have even dared to play that note. I mean, how could they? Why would they want to? What living person can convey something that only those on the very edge of that line can know/feel, when being on that edge means sacrificing so much, especially something so indulgent as writing? And should a writer attempt to convey such a thing, how could they even dream of conveying it with any semblance of honesty? How could they pull it off? Michael Kimball is a rare, rare writer, a writer whose empathy knows no limits. He holds the note of loss and his voice never cracks, not even for a moment. Kimball’s personal narration is interspersed in self-contained blocks throughout the book, co-mingling or co-existing, rather, with the voice and story of his nameless narrator. Kimball’s pull-backs are refreshing as they act to offer a slight reprieve from the hard sadness of the narrator’s expression, but they also act as manifestations of another hard sadness, a similar hard sadness, the one that inspired the book. In this way, the text, as a whole, is a muse to itself, which is where the hope lies. It’s that universe within a universe, or the hint of a universe within a universe, that keeps bubbling up in the books I’ve been reading lately. To me, that feeling, that sense of the circular, is what all writers strive to give their readers and themselves but it’s something few writers convincingly achieve. Kimball has achieved that here with seeming ease. The words rise off the page like smoke, and the story blazes like a firework in the darkness, a firework bound to leave lasting tracers once the powder has burned clean. The story of Us begins at the end of a wife’s seizure in the bed she shares with her husband, a seizure that cripples her consciousness. From there we move to the hospital for her awakening and her recovery, and from there we move back home, nervously, where there are no doctors or nurses should things go wrong, should another seizure (or something worse) grip her during the night. Kimball’s narrator uses short, declarative sentences to tell us his story in a simple voice that conveys very difficult things easily, like how he tried to drive himself home from the hospital, how they slowed their time down, how they practiced for her death, how love can accumulate between two people.